Liverworts, hornworts, and mosses are the examples of bryophytes. These are non-vascular plants i.e. do not contain xylem and phloem tissues. Spikemosses, clubmosses, ferns, quillworts are the examples of pteridophytes. They are termed as vascular plants as they contain xylem and phloem tissues. Generally, the plant can be divided into four parts which are roots, stems, leaf and flowers. On these basis plant kingdom is classified into two categories which are Non-flowering plants and Flowering plants. As plants which do not produce flowers are called as non-flowering plants, which are further classified as mosses and ferns. Mosses or bryophytes are simplest plants having no true roots, rhizoids for anchorage and grow in the damp terrestrial land. Ferns are pteridophytes which a have leaf (finely divided into small parts), proper roots and underground stems. They grow in damp and shady places. Flowering plants are of two types Gymnosperms and Angiosperms which have common features like roots, stems, leaves, proper vascular tissues for transportation and contain flowers and fruits. Below we will discuss the general difference between bryophytes and pteridophytes. Body definition Bryophytes has leafy or thalloid plant body. 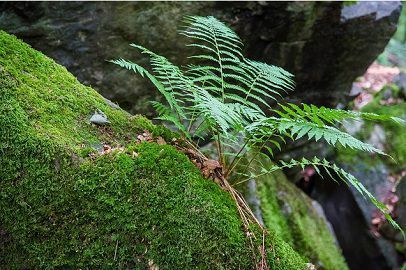 In pteridophytes plant body in differentiated into roots, stems, and leaves. Vasculature system No vasculature system, which means xylem and phloem absent. Proper vasculature is present which means xylem and phloem is present. Presence of roots No roots, instead rhizoids are present helps in anchoring Roots are present. Presence of stems or leaves No true stems or leaves are present. True stem and leaves are present. Archegonium and it's formation Common exposure of archegonium, whose neck is formed of six rows of cells. Partially embedded archegoninum and it's neck has only four rows of cells. Dominating part Gametophyte is dominating. Sporophyte is dominating. Cell type It has haploid cells. It has diploid cells. Examples Mosses, liverworts, hornworts. Spikemosses, clubmosses, ferns, quillworts. Sporophytic phase Depends completely on gametophytic. Saprophytic phase is an independent autotrophic. 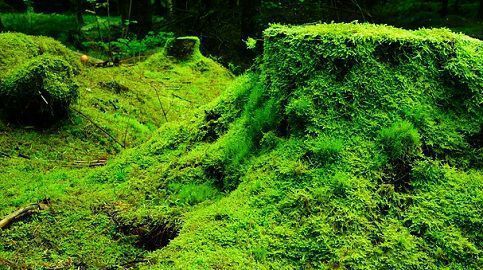 The name ‘Bryophytes’ is a traditional name, which is used to all such plants or embryophytes that do not have true vascular tissue and hence called “non-vascular plants”, which means they do not have xylem and phloem. As their gametophytic generation is dominating, they produce gametes. But they fail to produce flowers or seeds. Bryophytes body is not defined by true roots, stems, and leaves rather they have rhizoids for anchoring. They have unbranched sporophytes and reproduce by spores. Examples are mosses, liverworts, hornworts. They are limited in size characteristically and prefer a moist place to grow, but are adjustable in the drier environment also. Till yet around 20,000 species of the bryophytes are been found. Bryophytes play an important role in an ecosystem by providing water and nutrients to other plant living alongside bryophytes. As these plants do not produce either flowers or seeds, they are called as cryptograms. They are also termed as vascular plants (containing xylem and phloem tissues). They have leaves which are known as fronds, true stems, and roots. Pteridophytes include highly diverse true ferns. 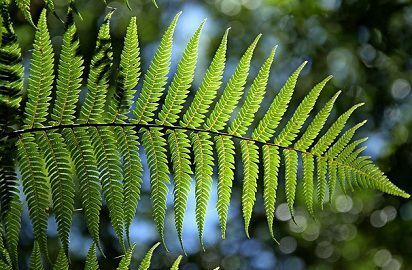 Fronds are the largest species of ferns and can reach up to six meters in length. Such plants get disperse via spores and reproduce rather than seeds. Bryophytes are used for medicinal purposes. These plants are found in moist, dark, shady, cool, damp area. Spikemosses, clubmosses, ferns, quillworts. There are around 13,000 species of pteridophytes which makes them representative of the closest relatives of the angiosperms, the conifers, and other seeds plants. The body structure of bryophytes has leafy or thalloid plant body, while in pteridophytes plant body in differentiated into roots, stems, and leaves. No vasculature system in bryophytes which means xylem and phloem tissues absent, whereas in pteridophytes proper vasculature is present which means xylem and phloem tissues is present. No roots are present in bryophytes instead rhizoids are present; In pteridophytes roots are present. No true stems or leaves are present in bryophytes, whereas pteridophytes have true stems and leaves. Archegonium and its formation are properly exposed and neck is formed of six rows of cell in bryophytes; Partially embedded archegonium and its neck have only four rows of cells in pteridophytes. Antheridium is stalked kind of bryophytes; In pteridophytes sessile kind of antheridium. Bryophytes are homosporous, whereas pteridophytes can be homosporous or heterosporous. In bryophytes, the gametophyte is dominating whereas saprophytes are dominating in pteridophytes. Examples include mosses, liverworts, hornworts of bryophytes while spikemosses, clubmosses, ferns, quillworts are examples of pteridophytes. Gametophytes of bryophytes are always autotrophic and macroscopic; while in pteridophytes, gametophytes are saprophytic or extremely reduced microscopic structures. Both have the heteromorphic alternation of generations. Flagellated male gametes while female non-motile. No siphanogamy, so fertilization is internal with the requirement. No separate asexual reproduction by spores as seen in algae and fungi. In the given article we discussed the differences and similarities among bryophytes and pteridophytes. Few bryophytes species are considered among the first to colonize on open ground, largely in the amphibious environment. It is a collective name used in representing plants like mosses, hornworts. While pteridophytes are specially considered as first land plants, containing xylem and phloem tissues, they are also called ‘botanical snakes’ as they evolved after bryophytes which are said to be as ‘botanical amphibians’. Both of them are important from nature’s point of view, as they play their vital role in maintaining the ecological balance.